Europe's only non-human primate, the Barbary Macaque, has gained the highest level of species protection at the Cites meeting in Johannesburg. While about 200 live safely on the Rock of Gibraltar, they are experiencing rapid decline in their natural habitats in North Africa. Hundreds of infants are illegally taken from the wild each year for European pet markets. Countries banned any form of trade in the species. The Barbary Macaque seems to specialise in isolation. It's the only African primate species north of the Sahara and the only macaque species in Africa. Experts estimate that there are between 6,500 and 9,100 Barbary Macaques in fragmented populations strung across Morocco and Algeria. They were categorised as endangered in 2008 as their numbers plummeted by 50% in 24 years. While destruction of habitat is a significant cause of their decline, another important factor is illegal trade. About 200 infants are taken from the wild in Morocco each year. Some are used as photo props for tourists in North Africa. Most are bought by Europeans wanting to raise them as pets. In Morocco, the animals sell for up to 450 euros each. In Europe they can fetch 2,000 euros. "People actually think it will be a suitable pet, it isn't, it's horrible," said Rikkert Reijnen of the International Fund for Animal Welfare (IFAW). "They need a lot of attention, they basically wreck your house and as they grow older they start to follow their natural behaviour, which is sometimes aggressive." Most end up in animal sanctuaries. Between 2001 and 2015, there were 545 reports of Barbary Macaques being rescued and sent to sanctuaries, mostly in France, Belgium and Spain. It's ironic that while the numbers in the wild are going down fast, the Macaque sanctuaries are over stocked. So great is the concern about the impact of this pet trade on their survival that Morocco, supported by the EU, asked the Cites meeting here to put the animals on Appendix I. It was the first time in 30 years that Cites considered increasing the level of protection for a monkey species. "This Appendix I listing means that the animal gets more attention from the authorities," said Rikkert Reijnen. "When an Appendix I-listed species starts coming in to your country illegally, the authorities start thinking twice. There are a lot of tortoises coming into Europe but it doesn't have that priority with law enforcement, so that Appendix I listing is critical in getting that priority." With an estimated 3,000 Barbary Macaques kept as pets in Europe, the EU is keen to be seen to doing what it can to stamp out the trade. MEP Gerben Jan Gerbrandy, is leading the European Parliament delegation to the Cites meeting and says that this is an important moment for the survival of the species. "The adoption of the joint proposal from the EU and Morocco would be a key next step in protecting a species for which the EU is unfortunately a key destination market. Now we have to make sure that any agreement is properly and coherently enforced to the fullest effect. That is where the real difference will be made." 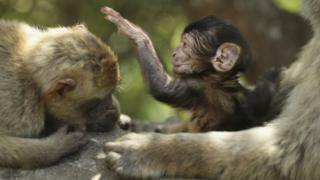 If the macaques are given increased protection, it may have some implications for Gibraltar. The population on the Rock has been kept to around 200 through culling, something that has proved controversial in the past. If the species is elevated to Appendix I it's likely that the populations would have to be controlled through contraception and other humane methods.